Please note that Cat-Skiing is currently not available to book through Whistler.com. * Please note tours are weather dependent and subject to change. Prices are also subject to change. The machines you see grooming ski hills are similar to the ones use to transport skiers/snowboarders into the backcountry. You can enjoy an exciting day with a certified guide, carving through powder and endless terrain while absorbing spectacular views. No lift lines, epic powder all day, great atmosphere and good value. How good a skiier/snowboarder do you have to be? Skiers and snowboarders should have strong intermediate skiing ability with experience in a variety of conditions including powder, trees and steep terrain. Snowcat skiing is unlike a resort style ski area. There are no maintained runs or grooming and the snow is often very deep. Much of the area is similar to an un-groomed black diamond run. Snowcat skiing is a backcountry experience. Snow can vary from fluff to corn and everything in between. Guides try and match the groups ability level to the terrain. Wear your snowsuit, jacket or pants that you would if skiing or snowboarding on the ski hill. Goggles, warm waterproof gloves and several thin layers you can take off are highly recommended. Powder specific skis or snowboard are recommended as the snow is really deep and your day will be much more enjoyable with appropriate equipment. What is the average vertical? Average between 6,000 – 8,000 vertical feet of riding per day. However, this depends on the conditions and the groups riding ability. Skiing in bounds can be a lot of fun, but sometimes you need to think outside of the lift. 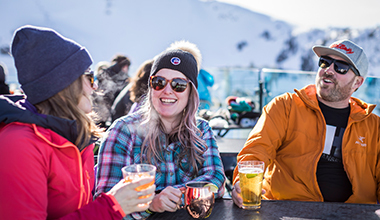 Learn about four ways you can ski, no lift ticket required. 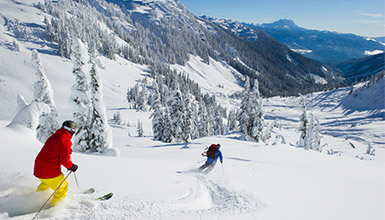 With no lift lines or chairlifts, backcountry skiing offers fresh powder, steep terrain and unbeatable views.